This paper examines the "island effect" in two enormously influential colonial fictions published in the final decades of the British Empire in India. 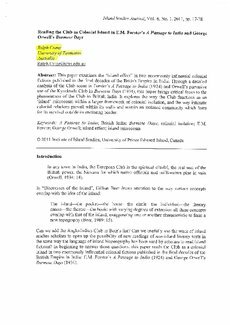 Through a detailed analysis of the Club scene in Forster’s A Passage to India (1924) and Orwell’s pervasive use of the Kyauktada Club in Burmese Days (1934), this paper brings critical focus to the phenomenon of the Club in British India. It explores the way the Club functions as an ‘island’ microcosm within a larger framework of colonial isolation, and the way intimate colonial relations prevail within its walls and sustain an isolated community which fears for its survival outside its enclosing border.